I was browsing my account at one of my favorite survey sites, the Midgam Panel, and was happy to note that in addition to allowing you to cash out on the Powergift card when you reach NIS 50 in rewards, you can now receive cash to your Paypal account, and another intriguing possibility - the Nofshonit Card. You can't buy these cards unless you're a business, and like the Powergift they're only good for use in specific stores (not the same stores as the Powergift - see here for their list) - but the interesting thing about this specific chargable card, good for 5 years, is that you can spend 115% of the amount of money you upload to it. 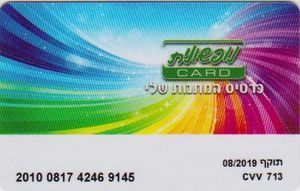 Namely, if you earn NIS 100 from filling out surveys on the Midgam Panel and upload it onto the card, you'll have NIS 115 to spend. Keep in mind that this doesn't include food or discounted items, but still, not bad. For general information about making money filling out paid surveys, see here.